Last week I showed how American state legislatures are largely polarizing over the past 15 years or so; the parties are getting ever more extreme and distant from each other, above and beyond the levels of the past. I ended that post with a question: “But which parties are driving this polarization at the state level? Are both parties at fault, or is one becoming more extreme compared to the other? That is, is state legislative polarization symmetric or asymmetric?” I will tackle this subject in my this post. 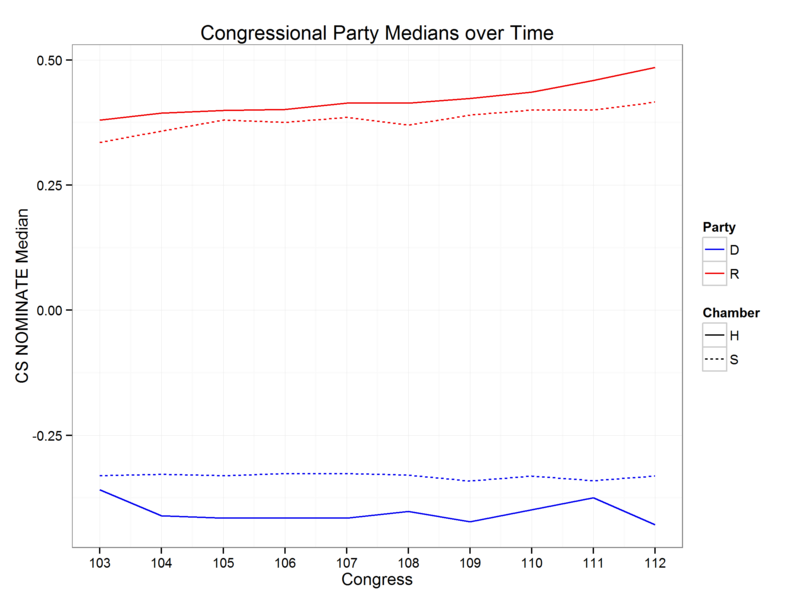 When we look at Congress over the past 20 years, we can clearly see that–in both the US House and Senate–the Republican party has gotten more extreme over time relative to the Democrats (though in the House Democrats have polarized to a smaller degree as well). This is a familiar story of asymmetric polarization. In fairness, Democrats’ move in the liberal direction started earlier than Republicans: the 1940s versus the mid 1970s. Still, in recent years, Congressional Republicans have unquestionably moved further, faster. The data and method that Nolan McCarty and I have developed shed light on trends in America’s state legislatures. Let’s look at the picture graphically, plotting party medians over time, separately for each chamber (click on the graphic for a higher-resolution version). By convention, more positive scores represent more conservative preferences, and more negative scores represent liberal preferences. Looking across the states, Republicans on the whole are clearly polarizing faster than Democrats. In 57 of the 99 state legislative chambers, they are getting more conservative over time, while in 47 chambers Democrats are getting more liberal. In 26 chambers Democrats are actually getting more conservative (eg, depolarizing), while the converse is true in 20 chambers for Republicans where they are getting more liberal. In 26 chambers Democrats are roughly stable and the same is true in 22 chambers for Republicans. But what the data clearly reveal is that states are wildly diverse. In some states like Tennessee and Colorado, Republicans are getting more extreme in recent time, while Democrats are not changing much. But in other states like Idaho, Mississippi, and California, it is Democrats who are largely responsible for the states’ recent polarization. And finally, there are states like Texas, Missouri, and Nebraska where both parties are polarizing roughly equally and simultaneously. So the polarization story is similar in some ways in state legislatures than in Congress: Republicans are leading the charge to the ideological poles on average. But it’s different, too: the average story obscures lots of differences across states. 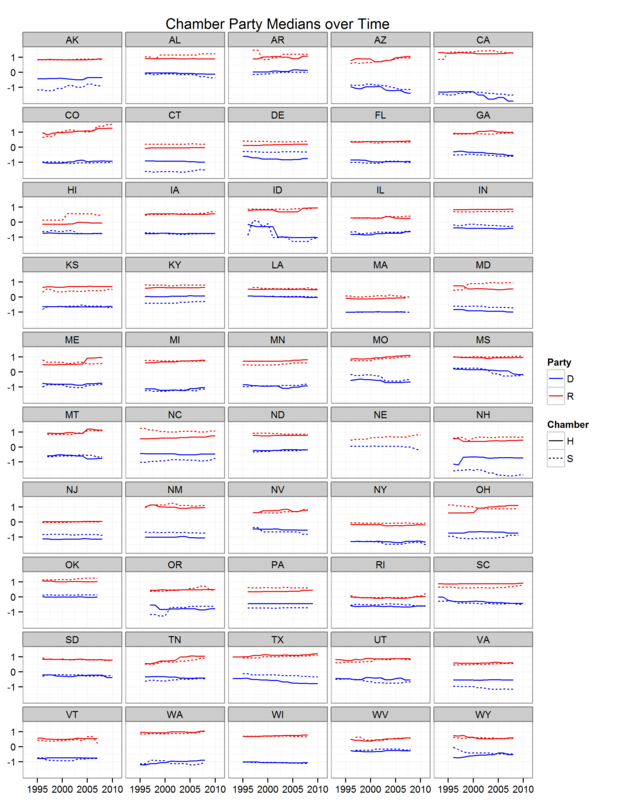 State polarization trends thus underline the usefulness of studying state legislatures as a laboratory for political observers: there’s just lots of variation to work with in trying to understand what causes what. And so we should look to state experiences to see whether reforms in areas like redistricting, primaries, campaign finance, and so on do anything to mitigate polarization, and whether some reforms might have unintended consequences that make it worse. This entry was posted in Ideology, Parties, Polarization on July 29, 2013 by Boris Shor.